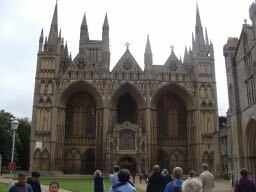 Today we took a side trip to Peterborough to see its cathedral, and its expansive and unusual west side. 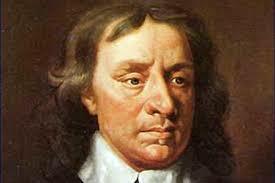 There will be some comments about Oliver Cromwell, pictured above - but that will come later. A bus picked us up and we trekked north and west up to the city of Peterborough, passing through rich fields some rich with sugar beets, and others with some type of grain. Flat and fertile would describe the countryside. After the small town comforts of Ely, Peterborough seemed quite busy and bustling. The Cathedral looms at one end of the Market Square, presenting the city with an unusual façade. An ancient abbatial church, Benedictine, it was made a diocesan cathedral following the dissolution of the monasteries by Henry VIII. 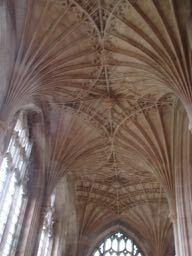 It represents, as do most cathedral churches, the layers of time, taste, and usage. 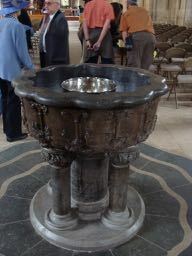 The first vision is of the baptismal font, recovered from a garden in the close. 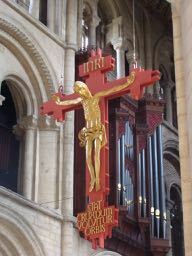 The eye is next drawn to the contemporary crucifix that hangs over the crossing. What is not easily perceived in other cathedrals, but seemed to be accessible here were the evident layers of redecoration and renewal. It was most especially seen in the Presbytery and its rather nice mosaic floor and the Victorian baldachino and high altar, which stand in contrast to the Norman surroundings. 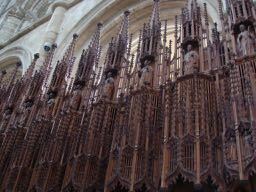 The stalls in the quire are Victorian as well, and quite handsome. 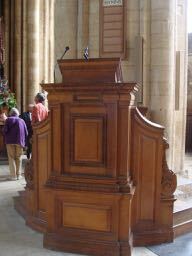 These stand in contrast to the pulpit and lectern in the crossing where what appears to be a Georgian pulpit and lectern stand. It is in the quire that the tour guide clues us into the history of the place, and the theme for today's reflection - the destruction wrought at the hands of Cromwell and his troops. 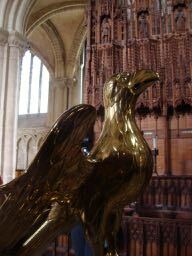 We are asked to look at the fine eagle/lectern in the quire. It is certainly beautiful, but not unusual. We see them everywhere in European and American churches. 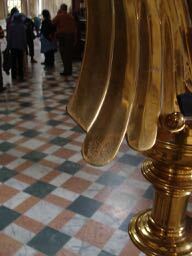 There is one aspect to this lectern that does make it unusual. Do you see anything missing? The story goes that the Cromwell troops thought that this lectern was gold, and sought to melt it down for the valuable metal. A monk clipped off a bit of the feather to prove to the soldiers that it was really brass, and thus the piece was saved. There was, however, major destruction. All of the medieval windows were destroyed. 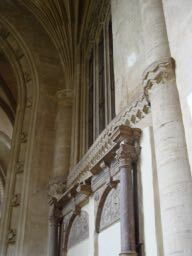 There is a small example of medieval glass in two windows behind the high altar. 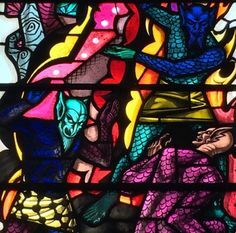 They were gleaned from the shards of the destroyed windows and present an interesting aspect (one seen in some German churches as well). 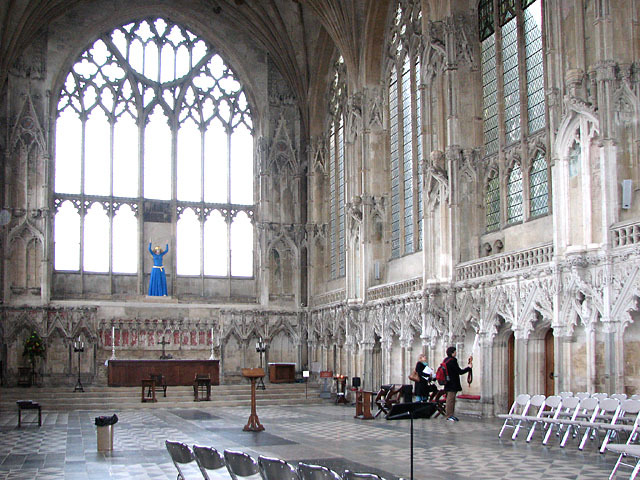 The most drastic example of this destruction can be seen in Ely Cathedral's Lady Chapel. It's perpendicular Gothic windows were totally denuded of their glass, presenting us today with a bright interior. Monuments were stripped from walls, ridding them of supposed papistic superstition and idolatry. In the photo below, we see two types of destruction. There are the remains of a family memorial, and above it you can see the remains of the old Norman apse (note the zigzag line that delineates the lower wall) and the 16th Century "New Room" with its flamboyant Gothic ceiling. So we see the destruction wrought from ideologues, and that from those who sought to improve the capacity of the place, replace removed sections with beauty. It seems to me that we are witnessing a similar destruction of institutions, education, cultural arenas, and natural resources all for the sake of a retrograde ideology. I can't be too critical of Cromwell when I sit back and allow the destruction of these things in my own time. (Off the high horse). It was a lovely day of seeing countryside and city, culture and humanity. 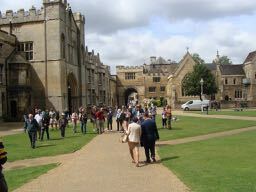 Before we left there was lunch in the cathedral close under a lovely green tree. 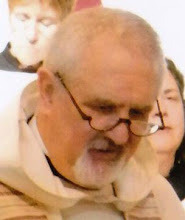 Yes, a fine day, finished later with Evensong on Saint James' Day, where I along with the choir participated in the Ely Cathedral's worship.